Small ornamental panels: Buddhas and minor figures under arches between pillars, from Jamal-Garhi. bl.uk > Online Gallery Home	> Online exhibitions	> Asia, Pacific and Africa Collections	> Small ornamental panels: Buddhas and minor figures under arches between pillars, from Jamal-Garhi. 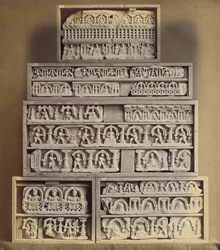 Photograph of some ornamental panels depicting Buddha and minor figures from Jamal-Garhi taken by James Craddock in the 1880s. A note accompanying these photographs reads, 'The plates entered here also include photographs taken from sculptures coming from Takht-i-Bahl and Shahr-i-Buhlul. No separate arrangement was possible. Nearly all the sculptures coming from these places are now in the Indian Museum, Calcutta." The panels shown in this photograph are decorated with repetitive designs. This differs from the majority of sculptural pieces found at Jamal-Garhi which depict scenes from Buddha's life. Jamal-Garhi was a Buddhist monastery located in the Peshawar district of northern Pakistan. From the first until the fifth century AD, Buddhism flourished in the Peshawar district which was known as Gandhara at that time. The city of Peshawar was the winter capital of a large empire and the monasteries in the area around the city attracted Buddhists from all over South Asia. The district was also home to a large number of skilled craftsmen who produced high quality sculptures in what can be broadly termed a Gandharan style. This style developed in the region of Peshawar from the first century onwards and bears affinities with Graeco-Roman sculpture. In this photograph the draped clothes and naturalistic modelling of the figure's bodies betray this influence.